Hi all, look at what Ive been making....... These would make fantastic Christmas presents. 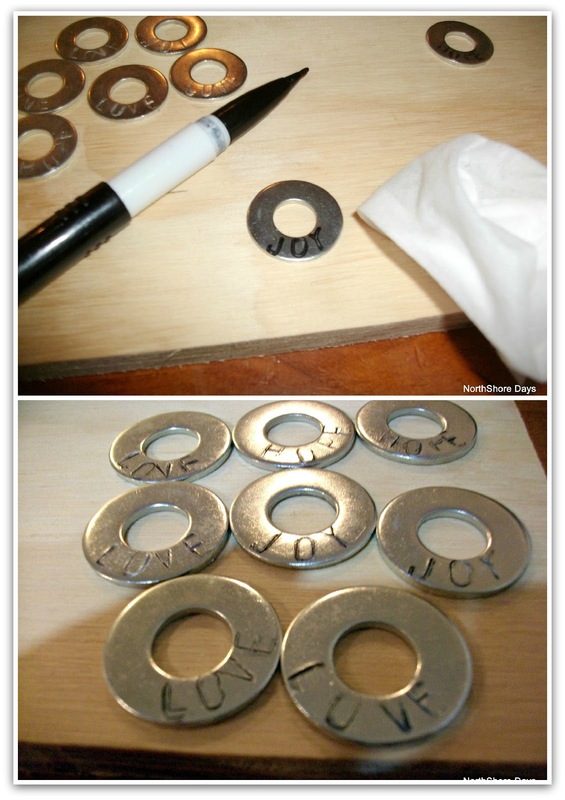 You will need a letter punch set, washers (any hardware store will carry them) and a hammer. I first tried this using a piece of wood as a base but you actually need a hard solid surface to get the best result. The wood cushions the blow from the hammer and you wont get a nice deep groove. I just need to learn how to hit that letter punch a little harder. Then using a felt tip pen, go over the letters and wipe off with a damp cloth to remove the excess ink. This enhances the word. WOW - those are super! Nats these are fantastic, how creative you are ! Desiree thank you so much for the inspiration and for popping by. Wow you are so clever Nat! Absolutely beautiful,love the colours Nats! You are so very creative and have so many talents. Aw Christina - thank you so much for featuring me on FB - Im so excited, your awesome! these are fantastic, I would never have guessed they were punched washers! Jenn from http://www.JustAddWaterSilly.com, hopping from serenity now. Great tutorial! I love the look of your necklaces! Thanks for linking up to our "impossibles" party! Thanks for linking this up too, great tutorial! What a cute idea! Thank you so much for linking up with the Cowgirl up! Linky party. We love looking through each post. We hope you'll link up with us again next week! These are adorable! Can you tell me what kind of stamp set you use? I found a few, but many have bad reviews. Also, where did you find the cute charms, etc...? awesome idea, which size washer did you use if I may be so bold to ask? I cant remember the actual size - I think about a 45cm size? They were the smallest ones in our hardware store. I have also used bigger ones which worked just fine. I adore these necklaces! I made one a few years ago for my daughter with her first name on one washer, and her sorority name on a larger one. I like your idea of adding charms or beads. I think I'm going to have to find my letter punch set. I know it's here somewhere! Found you via My 1929 Charmer linky party, and now following you! Hi Natalie! The washer necklaces are adorable! I have a 14 y/o daughter and I bet she'd love to make these with me! We will give it a try and let you know how they come out! Thank you for a great idea! 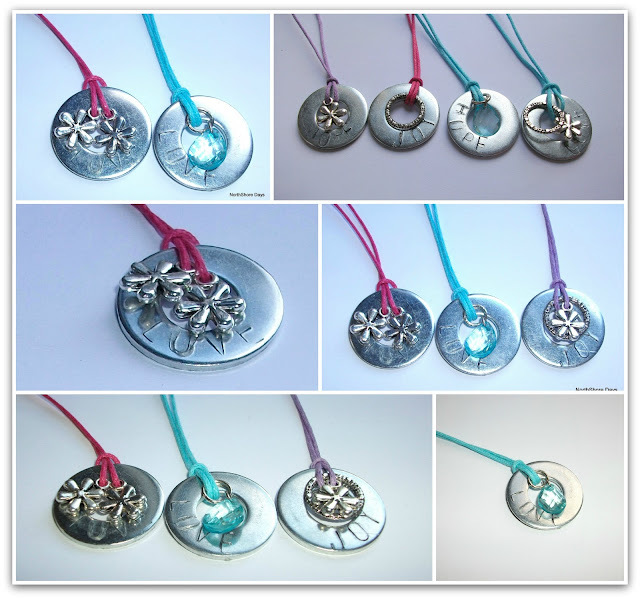 Great little necklaces - just perfect for gifts!